92 Pts - The expressive vivaciousness of citrus fruits offers plenty of freshness and crispness on the palate, with perfectly balanced acidity to complement the yeasty depth, freshly-baked bread flavours and ample structure. 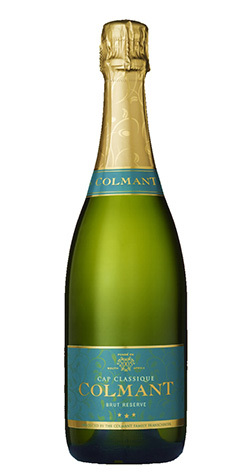 Colmant Brut Reserve is iconic to the house’s style, offering sophisticated freshness and elegance, while showcasing impeccable precision in balance of flavours and acidity. A subtle golden glow is reflected amongst a graceful dance of bubbles. The nose is delicate and elegant with its gentle spicy toastiness, a beautiful lemon and brioche perfume and the soft scent of mature stone fruits. The expressive vivaciousness of citrus fruits offers plenty of freshness and crispness on the palate, with perfectly balanced acidity to complement the yeasty depth, freshly-baked bread flavours and ample structure. The finish is complete and smooth, and offers a rounded tasting experience, together with the alluring caress of fine bubbles. The farm is located in the heart of the Franschhoek valley, and is surrounded by panoramic vistas of the majestic mountain landscape. A greater part of the farm is occupied by abundant Chardonnay and Pinot Noir vineyards, which each year will be used in the production of our Cap Classique wines. The rest of the farm is shared between our cellar & tasting room, various accommodations, beautiful gardens and trees, as well as an increasing number of chickens and vegetable patches. Today, they produce 50000 bottles of fine Cap Classique wines, across five different blends, and are beaming with pride at the quality of their wines as well as of the growth of the Cap Classique industry.